The food you find in your stores today was actually planted and planned months earlier. Talk about a little back to the future action. In order for our greenhouses to grow an adequate supply for your needs, we work with our retail partners to plan each store’s demands for approximately 6 to 9 months in advance. Our first harvest is typically 10 weeks after planting. As you walk into one of our pepper greenhouses you come across a ramp that starts 24ft above the base of the plant. Maybe it’s the openness of a greenhouse, but from personal experience when standing inside, you never fully recognize the magnitude of the height until you walk down the ramp to the start of the work area (base of the plant). From this perspective, you can definitely see how we use that height to our fullest advantage. 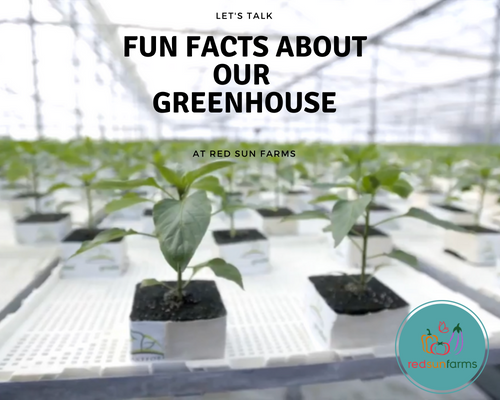 What makes the high-tech greenhouses are Red Sun Farms unique? We plant and grow our greenhouse seedlings at our very own propagation farm. Our seeds are planted & stay at our propagation for anywhere between 35 – 45 days depending on the crop. Our greenhouse plant density is approximately 10,000 plants per acre – without the use of height, we’d surely need a lot more space. Red Sun Farms grows on 588 acres, and we plan to expand. Right now, this acreage is equivalent to 450 – football fields, this means it’s nearly 6 times the size of Disneyland. A heated or unheated greenhouse plays a big role in how fast, hardy, and fruitful the plants will become. To maintain our greenhouse temperatures during cooler weather, water is heated to 185F/85C and circulated throughout greenhouses. Our hot water tank has a 158,500-gallon capacity. To put this in perspective, the average American uses 20 gallons of water per shower — that means our storage tank could supply enough hot water for 7,925showers! Just like us, who have to be fed, watered and nurtured, so do plants. Plant maintenance during growth is critical not only for the best fruit production but also to make the most of our greenhouse space. As the plants grow, the new growth is gently affixed to a string which hangs far above the plant's roots, the plant then climbs towards the greenhouse ceiling and natural sunlight. Height is also used to optimize the plant nurturing, just like in your home heat rises in a greenhouse, so the closer the plants get to the top of the greenhouse the more heat and exposure to natural sunlight they experience. Remember its always important to hydrate. Each plant within our greenhouse can consume 1-2 liters of water on average in a day. During the heat of the summer, this number can jump to 3 liters of water per day. Now that may sound like a lot of water, but our greenhouse production actually uses 5 times less water than you would see in a typical open field tomato production. We collect the rainwater off our greenhouse rooftops to sterilize and use in our plant production. This rainwater amounts for 75% to 85% of the water used in our production. 100% of the water and nutrients not consumed by the plant is sterilized, re-conditioned, and recycled back into the greenhouse. Our primary energy source is natural gas, a renewable resource. We can go on and on about random greenhouse facts, but we’ll leave more for another time. At Red Sun Farms our priority is with the customer; you – giving you the peace of mind that we know where your produce was grown, picked, packed and shipped to your store. From seed to plate we ensure the best quality produce. What’s next? To learn more visit How is Greenhouse Produce Grown? or share your questions with us, and as always give us a follow on social media.